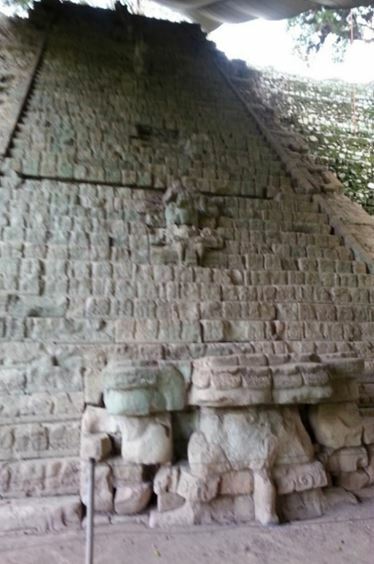 “Are we stopping at Copán to visit its famous Mayan ruins?” Inquired Shelley, my wife. “Definitely. Especially when it had been designated as one of the UNESCO world Heritage Sites for its historical value,” Was my response. We were passing through Honduras on our way from Nicaragua to Guatemala on road. Copán, in Honduras, a historic Mayan establishment, lies near the country’s border with Guatemala. Archaeological evidences suggested that the civilization itself might have started well before 2000 BCE and spread through Mexico, Guatemala, Belize, Honduras and El Salvador. The civilization followed a cycle of pre-classic, classic and post-classic periods, contracting between mid-sixteenth centuries to the end of seventeenth centuries. The discoveries at various sites pointed that the civilization had flourished in agriculture, architecture, arts, calendar, mathematics and astronomy. Our first stop was at a museum, just before entering the actual ruin-complex. In order to preserve the integrity of various sculptures found during the excavation, the museum houses many of these artifacts. The area was ruled by a succession of Mayan rulers, for example, the Great-Sun, the Moon Jaguar, and the 18 Rabbit, to name a few. Upon entrance, a well-carved stelae of a past ruler came to our view. A stelae depicts the achievements of that particular ruler, curved throughout the statue. 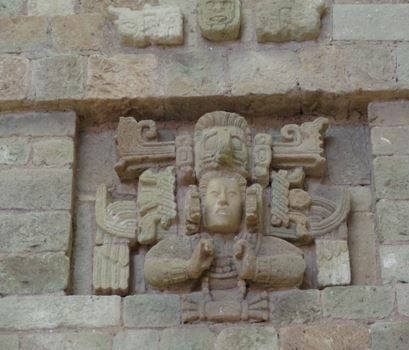 On the wall of one side of the hall, a well-preserved sculpture of an image a Mayan god, adorned with a bird-shape head-gear came to our view. Nearby, inside one of the glass display cases, a number of well-preserved excavated stone figure-heads, reflecting the evolution of the art, were displayed. 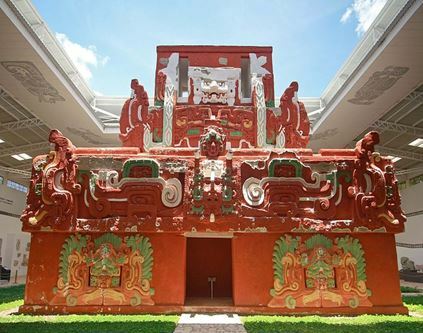 The museum also houses an exact life-size replica of a visually gorgeous temple, known as the Rosalila, adorned with various paintings and sculptures. 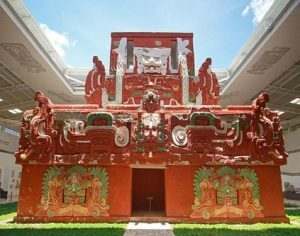 The original temple has still been nestled inside a partially-excavated temple (designated as Temple 16) that went through five different successive incarnations, following Mayan tradition of building a new temple over an existing one whenever a new ruler came into power. Following the museum-tour, we entered the ruin-complex, when we noticed several colorful parrots who made their home inside the ruin area, perched on various trees. Once in a while, the entire group of birds flew encircling the ruin-complex creating an impression of a floating rainbow in the gorgeous blue sky and under bright sunlight. Once inside the ruin-complex, various unearthed structures, for example elevated plazas for public gatherings came to our view. We began our exploration crossing a lush green central lawn and coming near to an excavated wall decorated with sculptures as well as hieroglyphs (written language of the Mayans). The study of these hieroglyphs found at various sites, shed light into the development and history of the civilization. Walking down from the wall, we arrived at a magnificent staircase of this ruin-complex. Each step was meticulously reconstructed with square granite blocks that were found at the base, from the collapse of the original one. Each block is curved with various hieroglyphs detailing various events. In front of the staircase, there are altars to place the offerings. The steps were covered overhead to shield it from the forces of nature and climbing them was not permissible. After accessing the upper level on a walking trail, we came across to various residence chambers fitted with rectangular openings, most probably serving as the windows. 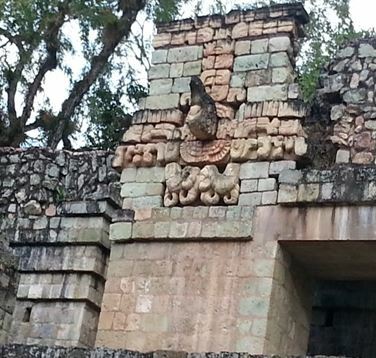 The panel underneath of a window was adorned with various time-specific head-figures, important to the Mayans. While walking around in the upper level, a panoramic view of the valley (where the civilization flourished) surrounded by the mountains came to the view. 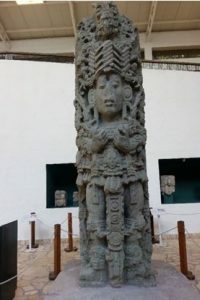 It should be noted that the lush greenery was supported by the namesake Copán River that had been re-diverted to minimize the damage from its flooding to the ruins. While coming down from the upper level to end our tour, we noticed a huge stone head of a toothless old man under a centuries-old tree. It seemed that the Mayans here also dealt with the concept of an old age, followed by death and most probably the after-life. One of the newly-discovered hieroglyphs might shed light into that world. All photographs courtesy of Shelley Chatterjee.